Molasses. Mmmmmmolasses. It was a bit of a sticky situation when Derrick announced that this month’s Sugar High Friday would feature molasses. Sticky for me, that is, since I tend to think of molasses as a winter ingredient. In fact, I use molasses pretty much exclusively for triple-gingersnaps at holiday time. Clearly I was in for a challenge. But as I began to explore the idea of molasses, visions of darkly sumptuous sweets began to dance in my head. Should I make a Treacle Tart? A Yeasted Molasses Spice Bread? A War Cake? At a certain point in my ruminations, I decided that I wasn’t going to use ginger or other spices, mainly because I wanted the molasses to be the star this time. Molasses is so often in a supporting role, using its considerable talent as a dark flavor enhancer. I finally settled on a dark, toothsome bar cookie with a pure molasses flavor. The inspiration for it came from the childhood memory of a chocolate chip date cake that my mother’s cousin used to make whenever her ramshackle Connecticut house was full of kids. I never had a recipe for it; I don’t remember if it had nuts or not, and I doubt that it had molasses in it -- although it probably contained brown sugar, molasses' soft and sandy cousin. I just remember that it was the first time I tasted dates and thought they were good – probably because they were combined with chocolate. So I added luscious medjool dates to my concoction. These served to underscore the sweet dark chewiness created by all that molasses. Crunch came into play when I decided to toss in toasted pecans. And rounds of dark chocolate provided…well, they provided chocolate. I was lucky enough to have flat disks of excellent bittersweet chocolate from my trip to Jacques Torres' shop a few weeks ago. This disk shape is a great thing, because once baked into a cookie, cake or bar, they give you these tectonic layers, a sort of series of geological striations of chocolate running through your confection. But if such a shape is not available to you, chunks or chips will work admirably, I'm sure. None of these chunky or chewy ingredients interfered with the deep taste of molasses, which is what I was after. A fair amount of salt gave a buttery counterpoint to the sweetness, and instead of the vanilla I would normally use in similar bar cookies, I chose to add a couple of spoonfuls of dark rum. Since both rum and molasses are derived from sugar cane, I thought the caramel flavors would serve to heighten each other. Which they did -- and do, since we still have some. We've been savoring them slowly and sharing them grudgingly. And that’s the story of how this sweet unassuming bar came into being. Although it bears only a mild similarity to that childhood cake of Connecticut summers, I think I actually like it better; it may even have the potential to be a memory-maker in its own right. These bars are similar to that church-supper favorite, the Congo Bar -- although mine are something of an extreme version. They make a nice change from brownies, yet still provide the choco-crunchy-chewiness you crave. It has been my experience that bar cookies are greeted with pleasure at any time of year. I wager that these will run true to form, and create even more happiness if paired with a dish of fresh seasonal fruit, scoops of sorbet or ice-cream. Mix butter, sugar, and molasses together; add egg and rum, beating lightly until combined. Toss pecans, dates and chocolate with 2 tablespoons of the flour. Sift the rest of the flour with the salt and baking soda, and add to the wet ingredients. Stir in pecans, chocolate and dates. Mix well. Spread batter evenly in a buttered, parchment-lined 9-inch square pan. Bake at 350° for about 35 minutes (check starting at 25 minutes). Cool in pan for 10 minutes. Turn out onto a rack, then cut into bars when cool. "It was an instinct to put the world in order that powered her mending split infinitives and snipping off dangling participles, smoothing away the knots and bumps until the prose before her took on a sheen, like perfect caramel. " I was thrilled when Debbie of Words to Eat By announced SHF #6: Stuck on You, with a theme of caramel. As food textures go, I’ve always been a big fan of all things chewy: nougat, sticky-type brownies and blondies, soft toffees, and of course, caramel. My caramel loves come in many guises, though, not just chewy ones. I love the flavor of caramel, not just the chew-factor. I’m fond of hard-candy caramels (like the Spanish caramelo which means any and all hard candy), caramel sauces, crème caramel, caramelized fruit a la upside-down cake…you name it, I like it (except maybe for banana upside-down cake, but that story’s already been told). And I always look for the square dark chocolate in an assorted box, since that shape often signals a chewy caramel. Early on, I dreamed ambitious caramel dreams. I had in mind a tart, with a crumbly, melting nut crust, a layer of caramel or dulce de leche, then pastry cream perhaps flavored with blood orange, and a sunburst topping of caramelized fresh pineapple rings. I even went so far as to buy the pineapple. But it was not to be. Time escaped me. It slipped through my fingers as fluidly as the moat of syrupy caramel that surrounds a newly-unmolded flan. Family crises, work necessities, in short, life – a sweet life, albeit a busy one – all intervened. So I found myself this week at the eleventh hour having to cut back on my honeyed vision. I decided on a version of Millionaire’s Shortbread – that sin-worthy treat comprised of a layer of shortbread, my favorite chewy-type caramel and chocolate. Millionaires and paupers alike have posted a veritable million versions of this treat online – some calling for milk chocolate, others for dark, some for cream-based caramel fillings, others for slow-cooked milk caramel. As a starting point, I used Nigella Lawson’s criminally rich recipe: Roxanne’s Millionaire’s Shortbread from How to Be a Domestic Goddess. I wanted to change it up a little, make it my own. I still had just one blood orange in the fridge, crying out to be used – and I thought its flavor would meld well with the flavors of my planned cookie/bar/slice. 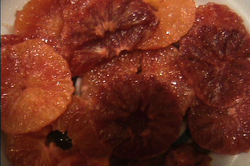 So I made a garnish: candied blood orange slices, to be cut into tiny segments for the top of each bar. I added a touch of ginger and a pinch of cayenne to the sugar syrup, all to good effect. The slices glacéed beautifully, keeping their color and shape. I let them dry for a night, and the next night made the shortbread layer, enhanced with the grated zest of a very large navel orange. Next I tried making the caramel. I had what I thought was the brilliant idea of substituting the syrup left from the blood orange slices for some of the corn syrup in the recipe. It was tangy and peppery – I thought it would give the caramel a great flavor. And it probably would have, except that it upset the chemistry of the recipe. The caramel, which is made in the microwave, curdled. It was not the satiny mass I had envisioned pouring over my lovely orange-scented shortbread layer. I tossed the cruddy caramel out, soaked the dishes and went to bed. There was always the next night. Which turned out to be the next day – even better. By a stroke of good fortune, I didn’t go to work. The subway wasn’t running due to a switching problem, and after three hours of trying to get to work, I gave up, went home, and started making caramel again. This time I adhered to the recipe (and yes, I use the microwave despite the fact that my-cousin-the-doctor has told me that microwaves are dangerous because they change the molecular structure of food. G’s comment: “Maybe it changes the molecular structure in a good way. How do we know?”) At the very end, when I had my silky bowl of caramel, I fooled around again, adding sea salt, vanilla and orange oil. It tasted great, and the texture was lovely as I poured it onto its shortbread pallet. In a trice I melted the dark chocolate, poured that layer on, and let the whole thing set while I ran off to teach a grad seminar. I came back to cut, garnish and photograph, and after dinner the moment of truth arrived as we actually tasted the bars. First bite – they’re delicious. Second bite -- they’re rich. Very rich. And very sweet. I ate a second one, and kinda wished I hadn’t. In fact, having cut a 9” square pan into 24 bars, I later thought that each of those pieces would be better cut in half, into tiny rectangles. They’re lovely in small doses, which means they’ll last a long time, hopefully. In the meantime, I’ll be bringing a plateful into work today, to see what my colleagues think. Cut the orange into neat 1/4 inch slices. Combine the sugar, water, Grand Marnier, ginger and cayenne in a pot, and heat until the sugar is dissolved and the mixture boils for a minute or two. Add the orange slices, bring back to the boil and then cook at a tiny simmer for about an hour, until the slices are candied and the syrup is reduced to a few tablespoons. Put the slices on waxed paper or parchment to dry, and leave them out overnight. Cut them into small sections and reserve (I made six segments each out of 4 orange slices to decorate 24 bars). Put the flour, sugar, salt and orange zest into a food processor fitted with the metal blade. Pulse a few times to blend. Put in 12 tablespoons of the butter cut in chunks, and pulse until you have a crumbly dough (you could of course do this by hand or with a pastry cutter). Press this sandy shortbread mixture into a 9-inch square pan that has been greased and the bottom lined with parchment paper; smooth it with your hands or a spatula. Prick it with a fork and cook for 5 minutes, then lower the oven to 300º, and cook for a further 30-40 minutes until it is pale golden and no longer doughy. Let it cool in the pan. Melt the remaining 12 tablespoons of butter for 2-3 minutes, then add the condensed milk and syrup. Whisk the mixture well until the butter is thoroughly incorporated. Heat in the microwave for 6-7 minutes until it is boiling, stirring thoroughly every 30 seconds (this is a bit tedious, but it takes lots less time than making milk caramel on the stove). It's ready when it's thickened and turned a rich golden brown: caramel color, of course. Beat in the sea salt, vanilla and orange oil. Pour this lush caramel evenly over the cooled shortbread and leave it to set. Break the chocolate into pieces and melt it in a bowl in the microwave. Pour and spread it over the caramel layer (the less you touch it, the shinier it will be) and leave it to cool. Once set, cut the caramel shortbread into pieces. 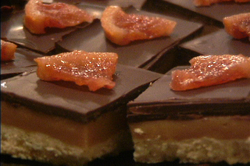 Decorate each square with a candied blood orange segment. The squares can be stored in the fridge during the summer, or just in a covered tin or container during cool weather. They’re good for at least a week, but can also be frozen for up to six months. This is my first SHF. In fact, it’s my first food-blogging event. I almost did IMBB11, but I had just started this blog and couldn’t quite make it happen. So of course this one had to be a scary one: puff pastry, hosted by that paragon of pastry, Clement of A La Cuisine! I could have done apples or nuts or spice; I make nice, simple, homey desserts with those ingredients all the time. Even white chocolate, which has only recently been admitted to my pantheon of dessert possibilities (I’m usually a “darker the better” kinda girl when it comes to chocolate) – even that I could have done. I coulda been a contender. But puff pastry? Yikes. So I guess that’s all by way of saying that I took the easy road here and used packaged puff pastry. Which turned out to be fine, just fine. What to make, what to make…I didn’t really feel like doing something classical, like pastry cream and berries. Although the fact is, I adore homemade rich custardy pastry cream and fresh berries, and part of me still really wishes I’d done that. There’s very little that could possibly be a better filling for any kind of pastry shell, I think. So I decided to go where no puff pastry that I know of has gone before. I knew I wanted some kind of creamy filling for the flaky flaky layers and layers, but something a little different. Don’t know where it came from, really, but like a bolt from the beyond, the idea of cannoli cream hit me. I love cannoli cream, which is basically sweetened ricotta cheese. In fact, I like it much better than cannoli. When I first moved to NYC from my ancestral home in the suburbs, going to Little Italy was an adventure. Now (if one's visiting friends insist on going there) it more closely resembles a hellish visit to a faux-ethnic theme park. However, back in the golden days, my favorite dessert was a dish of fresh strawberries with cannoli cream. And thus the birth of the puff pastry filled with cannoli cream. A French/Sicilian marriage, united by a New York girl…Cannoli? Napoleon? Napoli? No, no…Cannoleon! Other influences kept mulling around in my tiny mind. One such was the list of ingredients for the recent round of Paper Chef, which I also missed. These ingredients included wheat flour, oranges (possibly blood oranges), cinnamon and crème fraiche. The blood oranges stuck with me. So a side of blood-streaked sunbursts (blood orange slices poached in thousand-flower honey-Grand Marnier syrup) found their way onto the dessert plate. The other night when I made this felt like an episode of I Love Lucy. Especially when the baking sheet of pastry I put on the lower rack puffed up high enough to touch the upper rack, and I almost, almost couldn’t get them out of the oven without shattering them all. Also nervewracking was the moment when I had the pastry in the oven and the timer went off while I was trying to poach the orange slices and simultaneously smooth out the ricotta for the cannoli cream in the food processor, and then the phone rang. It was one of my graduate students with a question about this week’s assignment. And of course I give them my email and my phone number because I want to be accessible to them. BUT NOT WHEN I’M WORKING ON MY ENTRY FOR SHF! Guess I didn’t really stipulate that in the syllabus. Whoops. In any case, all was well, and my cannoleons finally made it onto the plate. I made a bunch of different pastry shapes, since I was playing with a new element. I wanted to see which one was best suited to the filling. Although not shaped like a napoleon or a cannoli, the little cups worked best for me. 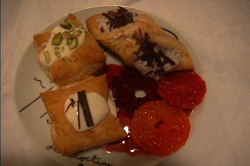 And I decided that I really like puff pastry. Especially the shapes that sort of came apart, which I ate plain, all by themselves still warm off the baking sheet. I can’t wait to use the leftover sheets, maybe for something savory this time. Pot pie, anyone? 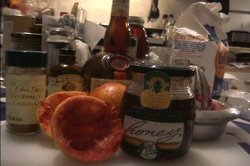 Place the juice of the squeezed orange (about 1/3 cup), the honey, Grand Marnier and cinnamon in a small saucepan. Boil over medium heat until the honey is dissolved. Add the slices of blood orange, and poach for no more than 5 minutes (you don’t want them to fall apart). Remove the orange slices to a dish to cool, and reserve. Cook the liquid down until it has reduced by at least 1/2. It should be thick and syrupy. Stir in the grated rind, and reserve. Once the syrup is cool, pour it over the oranges. In a food processor fitted with the chopping blade, give the ricotta cheese a brief whirl until more or less smooth. Add the rest of the ingredients, whirl again, and remove to a bowl. Refrigerate and reserve. Preheat the oven to 400F. Cut the pastry into 12 rectangles. Place 4 of the rectangles on a baking sheet lined with parchment paper. With the next 4, roll them diamond-wise around a narrow cylinder, such as a thin wooden rolling pin. Pinch two corners together (see pics) with a dab of cold water, and in each one, insert a small cylinder of parchment paper to keep them from collapsing. For the last 4, push each one snugly into the well of a greased muffin tin. Bake all for 15 minutes, until puffed and golden brown. Remove from the sheet and tin, and let them cool. Pull any bits of extraneous, semi-cooked pastry from the middle of the muffin shells and the cornets so that you have space in the center of each for filling. 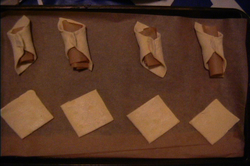 Split the rectangles into 2 pieces each, and peel away some of the dough from the interior. Fill each shape with some ricotta cream, and decorate with pistachios and chocolate curls. 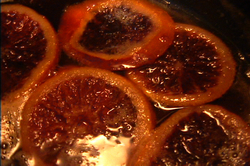 Arrange on plates with some slices of blood orange in syrup.